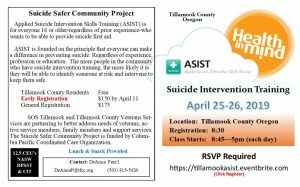 EDITOR’S NOTE: The Tillamook County Pioneer and SOS Tillamook have provided ongoing outreach and education about suicide prevention in our community through events, movie screenings, community conversations and trainings – there is another FREE ASIST training available April 25 & 26 – see more below. During this last week (April 7-14), Breaking the Silence”– Oregon journalists devoted the entire week to reporting on stories of suicide prevention and stories of hope and healing. 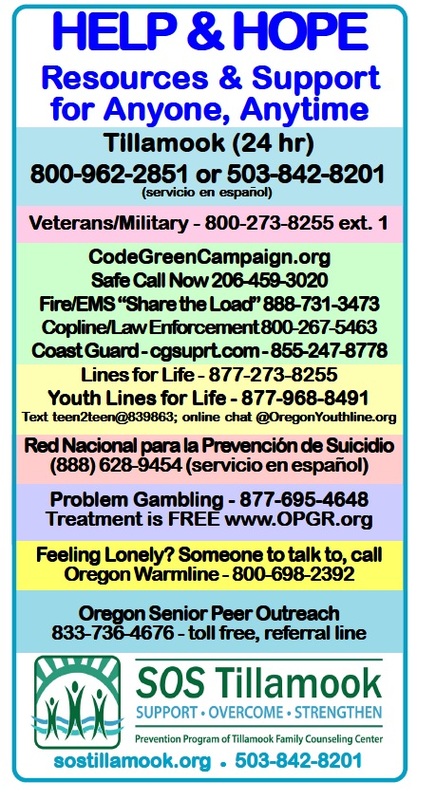 Oregon journalists are determined to “break the silence” on talking about suicide, with responsible reporting about this public health crisis and the solutions we are trying to build as a community. We are facing a public health crisis of suicide – but we also know that for every person who dies by suicide, there are 280 people who seriously think about suicide — but instead choose to live. That’s 280 remarkable stories of hope and healing. 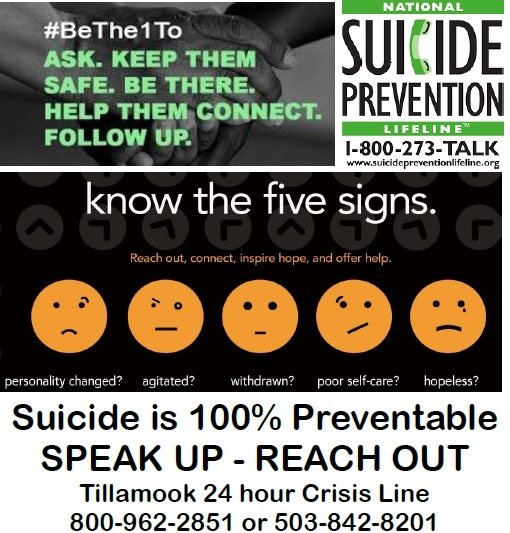 The Tillamook County Pioneer is committed to providing information and outreach and will continue taking the remarkable step to tell those stories, in the context of the public health crisis, to help break the silence on suicide, erase stigma, and launch an overdue and public conversation about suicide prevention and mental health supports. We know as long as suicide is in the shadows, we fuel the stigma to getting help – we make it so that people in need suffer alone, rather than reaching out to the help and hope we all work to provide. People arrive at suicide crisis for many reasons but, typically, it’s because they’re overwhelmed by a problem they may not be able to solve themselves. Stress becomes anxiety if left unchecked. Anxiety can lead to depression. Depression can lead to hopelessness that can lead to a person with thoughts of suicide. Left unchecked, an adverse experience such as bullying or loss of a friendship at school can be the tipping point. Without outside help, he or she could easily become overwhelmed with the situation and such situations can, and do, lead to thinking about suicide. Another example of a person who may be in crisis is a person with a mental illness such as clinical depression. A person suffering from depression, particularly if they’re not in treatment, may be driven to suicidal feelings because of an illness they didn’t ask for and cannot control. A person with clinical depression will likely need professional help to get them out of this crisis. Let’s flip the perspective. When training is provided, often we talk about what is the perspective of the person with thoughts of suicide? To really know how to approach them, you need to understand their lens. Too often, a person in a crisis state cannot see anything but their pain: physical and/or emotional pain. Their perspective becomes myopic and colored with feelings of hopelessness. They cannot see the hands reaching out to help or the resources taped to the wall. This too often becomes frustrating for the friends and loved ones of the person at risk.